The definition of the best rake differs from one person to the next. For some, it involves mainly the length. Whereas, for others, it is all about the weight and ease of use. Similarly, some want it for heavy use while others want it for every day raking tasks. Keeping all of these things in mind, we have compiled a list of the best rakes that carry all of these features. Keeping your yard clean is one of the many ways to achieve a healthy lawn. Plus, it also adds to the overall pleasing look of your property. If you are on the lookout for one, here are three of the best ones currently available on the market. The Gardenite Adjustable Garden Leaf Rake is for all those gardening enthusiasts who have trouble raking up fallen off leaves. 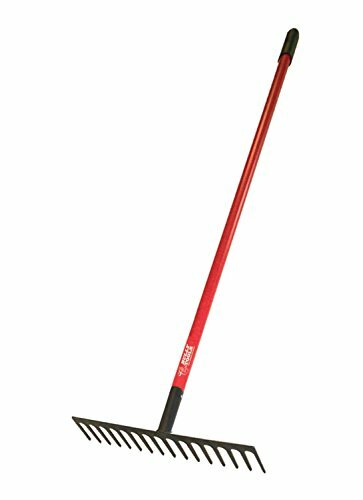 The rake comes with an adjustable length handle that can be protracted to up to 63 inches. The metallic head of the rake features a foldable functionality that lets you fix it anywhere between seven and 22 inches. The head, on the other hand, comes with 15 flat tines that can easily reach all the challenging areas in your yard. Last but not the least, the rake comes with a 100% customer satisfaction guarantee. So, even if an issue occurs, you won’t have to worry. If you don’t like anything about this rake, you can always contact the customer support who will make sure to solve your problems until you are completely satisfied. Another rake on our list is the 92311 Rake by Bully Tools. The manufacturer, Bully Tools is a well-known US-based brand. They are best known for their reliable and durable lawn, garden, and snow removal tools. The 92311 Level Head Rake is one of their most popular products. 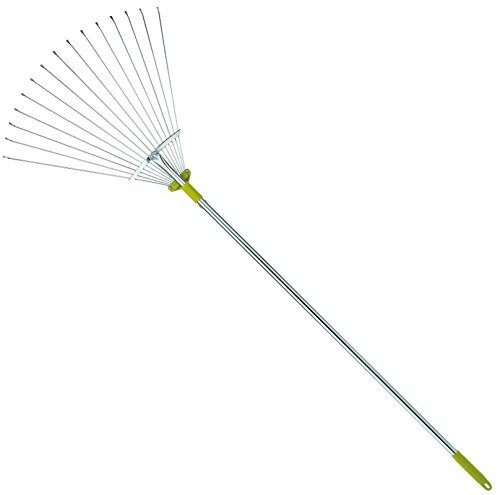 This is an advanced and improved version of a classic rake from the manufacturer that comes with a 60-inch long handle. The handle is constructed with triple wall fiberglass material that makes it live on for almost eternity. The head of the rake features 16 well-built steel tines having a total width of 16 inches. This lightweight rake with its super thick seven gauge material is specially designed for commercial grade use. The manufacturer, Bully Tools, has ensured to provide an improved and more practical design of rakes in the form of the 92311 Level Head Rake. This telescope rake by EZ Travel Collection features a unique folding design that ends up taking less space in your storage. The rake features an adaptable length handle that can be extended from 32 inches to 62 inches. This heavy-duty rake also comes with a metallic lock and release switch for keeping the setting in place. The rake features an ergonomic handle with a rubber holder that makes it easy to hold. Plus, the tines of the rake are made of high-grade steel material that makes it ideal for serious raking jobs. The tines can also be widened up to 19.5 inches, which enables you to use it for various raking jobs. The adjustable tines of the rake allow you to easily grab all the stuff from small spaces where other rakes cannot reach that easily. The adaptable length of the handle enables you to fix it as per your convenience and requirement. So, which one of the three rakes takes the lead? Well, even though we are in love with all of them, if we’d have to pick only one, we will go with the Gardenite. There are many reasons for that. 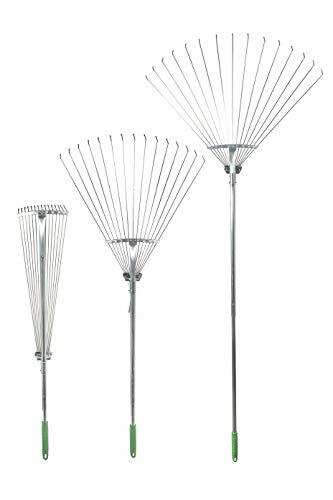 First off, the Gardenite Adjustable Garden Leaf Rake features a longer handle than the other two rakes we have reviewed here. Aside from that, it is also very easy to hold because of its light weight. For your convenience, you can adjust its height and tines according to your intended use. It also requires little to no maintenance as it can’t fall prey to either rust or corrosion. Most of all, it comes with a satisfaction guarantee, which is something that not every other manufacturer offers.